This little pendant is kind of like a locket, except it doesn't lock, and it's pretty quick to make except for curing time. Mine has photos of my kids in it. Wood shapes- I used hearts! Quick notes- I used my Fiskars Craft Drill, it's hand powered, quiet and easy to use. The glitter is Martha Stewart -Garnet, and the jump ring is made from 18 gauge copper using a knitting needle as a mandrel. The hearts were from a mixed bag of heart wood shapes. You'll need two shapes the same size and shape, so if you have a bag of shapes, sort through and pick out 2 the size you want to make the pendant. Then it's time to drill them. I used painter's tape to wrap them securely together. That let me drill both pieces at once to have the holes in the right place, plus wrapping them in tape helped keep the soft wood from splitting. You can also drill one, then use it to mark the other one to drill it. Now take them apart if you've taped them together, and sand both hearts smooth. Then you'll paint them. They need to be painted and glittered in mirror image to each other so there is a front and back. Let the paint dry, then put on a coat of decoupage medium and GLITTER! After the decoupage glue has dried, add another coat to seal the glitter so the finished pendant isn't leaving glitter everywhere. Let dry. Then it's time to start with the photos. Measure your hearts to resize photos to fit, or draw little pictures on paper or cut images from a magazine. It's your choice, it's your necklace. Trace the hearts on the image, paying attention to where the holes will be so you don't accidentally wind up with a hole in the wrong place. Cut out just inside the outlines using the scissors. Place the heart over the image, and mark where the hole is to punch it. Repeat for the other image remembering they need to be mirror images for hole placement. 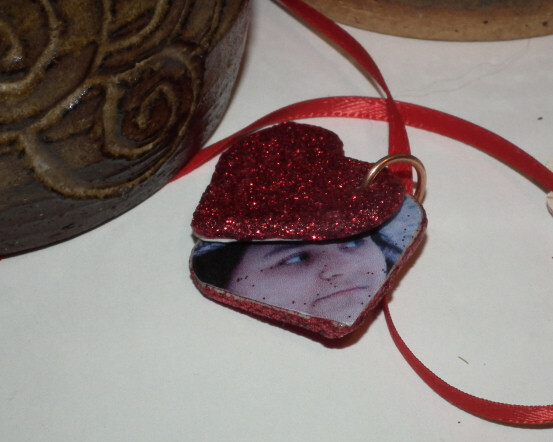 Decoupage the unglittered sides of the heart with the images. Make sure the holes are clear using some sort of needle type tool. Let the hearts cure, Over night should do it. Then you just need to connect them with the jump ring and hang from a ribbon! You aren't limited to just hearts of course, stars will work. If you wanted, you could make a mini book by cutting pages to fit, punching holes and using a bigger jump ring. 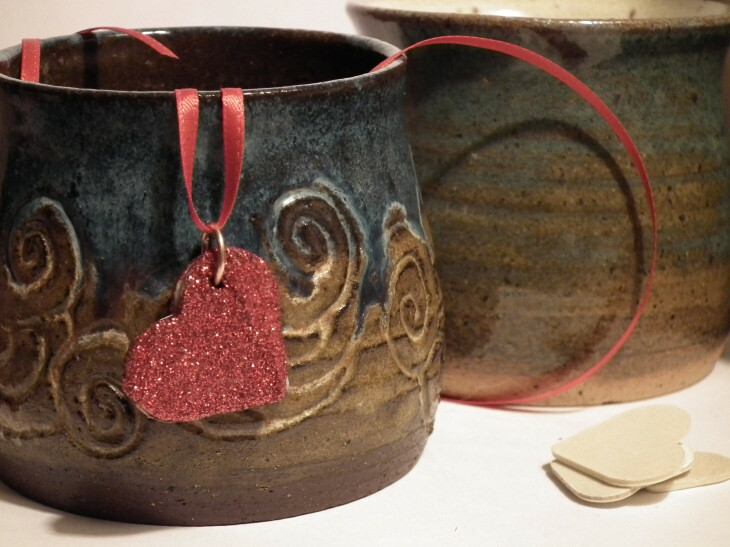 The cups in the photos are made by Silverbear Sundries. Thank you! Glitter is so much fun!